Not only are the good for the environment, biodegradable plant pots are also great for plants. They can help reduce transplant shock as the root systems of seedlings are not disturbed when planting out. This type of garden pot is becoming popular with consumers and growers alike. 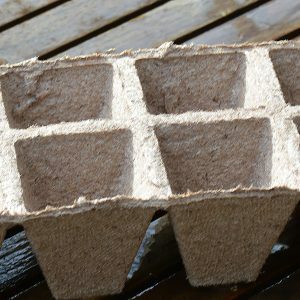 Materials uses include Coir pots, bamboo pulp pots, cardboard and ‘plastic pots’ made from a biodegradable starch, all popular alternatives used extensively for general nursery propagation especially herb and vegetable seedling production, revegetation projects to reduce transplant shock and hydroponics. They are single use, compostable and biodegradable, they increasingly meet the the demands of the environmentally aware consumer. 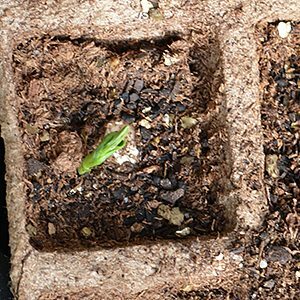 Plants can establish root systems through the container without having the roots disturbed. Excellent for revegetation projects where minimal handling is desired and essential for plants that are sensitive to root disturbance. They are made from renewable materials. The big advantages of Biodegradable garden pots is that they can be planted straight into the ground where they will gradually decompose. You can also buy wooden moulds for making your own pots from newspaper, a great way to propagate vegetable seedlings. Pictured right we have a Snow Pea seedling that has been germinated in a biodegradable pot. As it forms another 3 – 4 sets of leaves it will be planted out into the vegetable garden. This has allowed for faster gemination, and has protected the seedling from snails and slugs at the early stages.